X-rays have predominantly been used in the medical field, but have also made differences to the areas of quantum mechanics, crystallography and cosmology. Of course, we’re most familiar with cumbersome X-ray systems holding us up in airports. One of the key components in an X-ray system is the X-ray detector which captures the X-rays after they have passed through an object – be it a section of a human body, animal, pipe or a parcel for example. As X-rays pass through materials they are absorbed differently depending on the material’s density. The X-rays that are captured by the detector are therefore a representation of the properties of the object the X-rays went through. 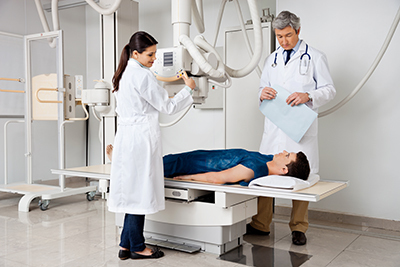 X-rays are known for their harmful effects and therefore exposure to them has to be kept to a minimum particularly in medical applications. A good detector is therefore one that can resolve an image with a good contrast at a very low X-ray dose. This requires the X-ray detector to have transistors that turn on quickly and capacitors that are capable of holding charge long enough for the image to be read. The majority of X-ray detectors are currently made using amorphous silicon as it is known to satisfy these characteristics. Amorphous silicon based X-ray detectors are made on glass which makes them heavy and breakable. The X-ray detector plate is usually carried by the X-ray system operator. The weight of an X-ray detector can reach a few kilograms depending on size. This weight comes mainly from the glass on which the sensor is made and also all the housing that is installed to cushion the glass from breaking in the event of a drop. Such housing can add cost and complexity to the X-ray sensor which a plastic based X-ray sensor will not incur. Moreover a plastic based X-ray detector will be significantly lighter than a glass based detector. A plastic based X-ray sensor can potentially also be conformed to objects thereby allowing a new range of applications that weren’t imaginable using a rigid X-ray detector. One way of making a plastic based X-ray sensor is to use flexible electronics to create a large-area transistor array on plastic with an organic photodiode on top in order to make a thin and shatterproof backplane for various imaging applications including large X-ray sensors. With a very mature amorphous silicon technology, companies are finding it difficult to differentiate their offering at acceptable margins and plastic based X-ray sensors could be the answer. If you want to learn more about our integrated image sensor solutions for flexible X-ray and other photo-imaging based array sensors, contact us at info@flexenable.com.